Thirty-five years after their release, Japanese-American internees placed in the poorest camp, Arkansas' Rohwer Relocation Center, earned 17 percent less than those placed in more affluent regions, such as Heart Mountain, Wyo., (pictured). Japan’s attack on Pearl Harbor in 1941 drew the United States into World War II and spawned a massive wave of shock and fear across the country. It also prompted the U.S. government to round up and send more than 100,000 Japanese-Americans to internment camps. Scholars have long studied this dark chapter in American history and its denial of basic freedoms, but until recently little was known about the long-term economic effects on the lives of the people who were interned, their businesses, homes, and possessions hastily left behind. Harvard economist Daniel Shoag and Nicholas Carollo, a Ph.D. candidate in economics at the University of California, Los Angeles, who wrote the paper “The Causal Effect of Place: Evidence from Japanese-American Internment,” found that the economic consequences of confinement lingered among internees even 50 years later, and varied greatly on where they were placed. Between 110,000 and 120,000 Japanese-Americans, 70 percent of them born in the United States, were forced to leave their homes on the West Coast and incarcerated in makeshift camps in desolate areas until after the end of World War II. When the Japanese Exclusion Act was revoked in 1945, the inhabitants were released, but their economic prospects were markedly, and forever, changed. The economic impact on WWII Japanese-Americans placed in internment camps was felt for generations, notes Harvard Associate Professor of Public Policy Daniel Shoag. Prior to the war, most Japanese-Americans had similar incomes and educational backgrounds, but after they were assigned to 10 camps across seven states — Arizona, Arkansas, California, Colorado, Idaho, Utah, and Wyoming — their economic fates changed. All internment camps were prison-like compounds, with barracks, watchtowers, and barbed wires, but some were close to wealthy regions and others to depressed areas. The study found that those internees who were sent to richer regions, where the local population earned close to the median income, had better opportunities upon release and did better economically than those who were sent to poorer places. Internees who were sent to wealthier locations earned more and were more likely to complete college and work in higher-status careers. Those who were put in poor, rural areas far away from cultural centers received less education, lived in worse housing, and earned less money. “The long-term impact of being put in a poorer place was large and dramatic,” said Shoag. 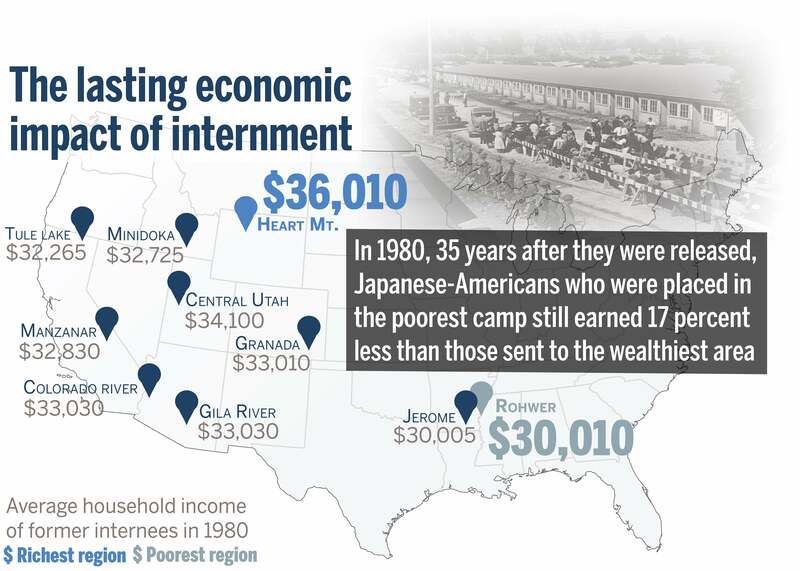 The economic effects of internment could be measured across generations, the study found, and affected the internees’ children. Their economic outcomes affected the values they held as well: Those from better-off areas tended to be more assimilated into U.S. society, and were more materialistic and optimistic, said researchers, based on survey data from the Japanese-American Research Project (JARP), a three-generation study (1890-1966) directed by the late UCLA sociologist Gene Levine. Those sent to poorer areas found it harder to get ahead. Many of them failed to get higher education, and their children’s futures were compromised, said Shoag. Researchers used detailed administrative data from the U.S. government, which helped to track nearly 90 percent of the surviving internees during the process of making restitution payments. With data spanning five decades, researchers were able to measure outcomes for the internees, their children, and their grandchildren. The researchers found that in 1980, nearly 40 years after the Japanese-Americans were first interned and 35 years after they were released, those who had been placed in the poorest camp (Rohwer, in Arkansas) still earned 17 percent less than those placed in the camp in the most affluent region (Heart Mountain, in Wyoming). The findings have broad implications for immigrants and refugee settlements. 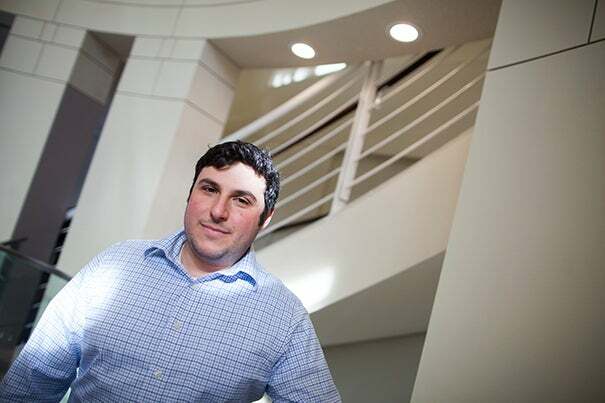 Policymakers and governments officials need to understand the importance of location assignments for the economic futures of immigrants, said Shoag. The research found that many internees chose not to go back to their original homes on the West Coast, both because they feared racial enmity and because of housing shortages. Many wound up remaining in communities near their former internment camps. Shoag said government officials should keep in mind the long-term effects of any policy involving placement or relocation when they deal with immigrants or refugees resettlements. The location can help to determine their future. Former New York City Mayor Michael Bloomberg addresses the 40 mayors from the U.S. and abroad who gathered in New York City for the inaugural session of the Bloomberg Harvard City Leadership Initiative.